This is part 2 of a 5 part series. Go to part 1 to register now. 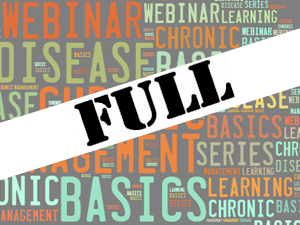 “Back to Basics: Chronic Disease Management” is a webinar learning series designed for nurses, allied health professionals and organizations who wish to enhance the use of evidence-based practices in relation to the prevention and management of chronic diseases. The increasing incidence of chronic disease has created a need for health-care organizations to re-think approaches to chronic disease prevention and management. The use of evidence-based practices by health-care providers is required to reduce the burden of chronic disease, support optimal client and organizational outcomes and system sustainability. This webinar learning series consists of a two hour learning module once a week for five consecutive weeks. Each module will commence with an overview and description of a model, theory or concept known to be relevant and effective to the prevention and management of chronic disease. Following this, an exploration of how organizations have applied such models, theories or concepts into practice will take place. Modules will be facilitated by researchers, educators and leaders from various health-care settings. For further information email Andrea Stubbs, Project Coordinator.